North Shore Dish is excited to announce our first-ever giveaway! And believe us, this is a contest worth entering. 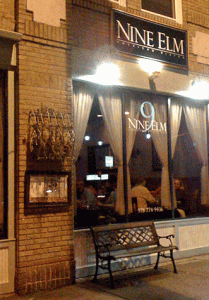 We are giving away a gift certificate worth $100 from Nine Elm American Bistro in Danvers. The Boston Globe said Nine Elm “deserves to be a regional draw,” and we agree. We’ve enjoyed dinner there on several occasions, and you can find our post about the bistro here. To enter, leave a comment on this post answering the following question: What North Shore restaurant is your favorite hidden gem? Deadline for entries is midnight on Thursday, July 1, 2010. A winner will be chosen Friday, July 2 by a random number generator and notified by e-mail. You must enter a valid e-mail address with your comment. US residents only, one entry per person. Good Luck!